Heated indoor classroom and riding arena for learning! Instructor/ Owner: Alison Grosse is an accomplished rider and trainer. She has earned National, Regional, and Local awards. She instructs riders of all ages and abilities with impressive results, including National Championship titles. Students are nurtured to learn and progress at their individual abilities. 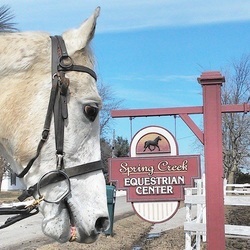 Alison owns and manages Spring Creek Equestrian Center which houses about 25 horses and is a busy, fun barn for families. During this class the students will be working towards hands on instruction and time with the horses. Students will learn the basics in horse care, equipment care and use, how to groom and prepare a horse for riding, barn and horse safety, and barn and horse maintenance.